Several surgical methods have been proposed to manage this rare condition. Uveal effusion, also referred to as choroidal detachment, can occur secondary to a number of ocular conditions that result in inflammatory or hydrostatic changes, including scleritis, posterior uveitis, and hypotony after glaucoma surgery.1 When no cause can be identified, this entity is termed uveal effusion syndrome (UES). It is by definition idiopathic but can be associated with nanophthalmia or hypermetropia in some cases. • Uveal effusion syndrome (UES) is a rare idiopathic cause of choroidal detachment that may be associated with nanophthalmos and increased scleral thickness. • Diagnosis of UES is often delayed due to an overlap in clinical findings with posterior uveitis and intraocular lymphoma. • The authors describe their own technique for surgical management of UES, which involves creation of scleral windows in four quadrants. Figure 1. Widefield color fundus photograph of an eye with UES depicting peripheral choroidal effusions with overlying serous retinal detachment (A). Postoperative appearance of the same eye after the creation of scleral windows shows flattening of the choroidal effusions and resolution of the serous retinal detachment with VA of 20/30. Persistent leopard spot hyperpigmentation is seen (B). These proposed mechanisms are not mutually exclusive, and the end result is believed to be transudative exit of fluid from the choriocapillaris into the surrounding potential space. This leads to choroidal swelling and detachment. Fluid may also accumulate in the subretinal space, resulting in concurrent exudative retinal detachment. UES is a diagnosis of exclusion. The clinician should first rule out other causes of choroidal effusion and serous retinal detachment, such as posterior scleritis and uveitis, choroidal neoplasia such as uveal lymphoma, paraneoplastic syndromes, metastatic tumors of the choroid or retina, hypertensive choroidopathy, postoperative inflammation from cryotherapy or photocoagulation, and persistent hypotony. B-scan ultrasonography can be used to document the presence of retinal and/or choroidal detachment. Often, the choroid and/or sclera will be thickened. It is not uncommon to see annular thickening of the anterior choroid, often captured best with ultrasound biomicroscopy. Ultrasound is helpful in identifying secondary causes of observed fundus changes, including choroidal tumors or the T-sign seen in posterior scleritis (a hyporeflective layer of fluid in the Tenon space surrounding the nerve).3,15 In ruling out other conditions such as scleritis, standardized A-scan ultrasound provides accurate axial length measurements to identify nanophthalmos. Figure 2. FAF demonstrates leopard spots. In principle, prostaglandin analogues could be helpful by increasing uveoscleral outflow.11,20 Derk et al reported resolution of effusions after 3 months in three patients with bilateral disease who were treated with a combination of topical latanoprost and oral acetazolamide.21 Prostaglandin analogues have not been evaluated for the treatment of UES in any large clinical studies. Several surgical treatments have been described, with the surgical goals being (1) direct (internal or external) drainage of the subretinal fluid, (2) reduction in scleral resistance to allow fluid evacuation from the suprachoroidal space, (3) unroofing of the vortex veins, or (4) a combination of approaches. Figure 3. Marking a 5-by-5-mm scleral flap. Figure 4. 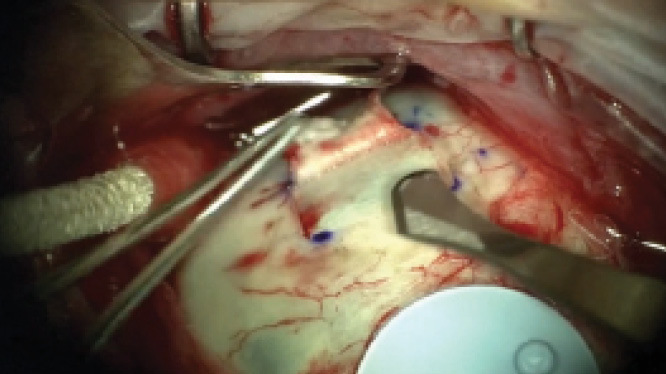 Dissection of scleral flap using a No. 57 scleral blade. Figure 5. Creation of sclerostomy using Kelly punch. Our own preference is to perform four-quadrant scleral windows. After the conjunctiva is exposed, the four rectus muscles are isolated and the oblique quadrants revealed. A mark is made to outline a 5-by-5-mm scleral flap in mid-quadrant, about 4 mm from the rectus muscle insertion (Figure 3). Using a No. 57 scleral blade (Alcon), an 80% scleral thickness lamellar flap is outlined and dissected (Figure 4). Then a smaller, inner scleral 3-mm incision is made down to the glistening fibers of the outer choroid but clearly into the suprachoroidal space. It is important not to have any thin lamella of tissue covering the uveal tissue. Next, using a Kelly punch, the inner lip of the remaining scleral lamellar fibers are removed to create a round circle of exposed uveal tissue (Figure 5). The outer scleral flap is then amputated. (Alternatively, it can be sutured back without significant tension.) This is repeated in the other three quadrants if there is adequate exposure. We do not purposely try to unroof or disturb the vortex veins. 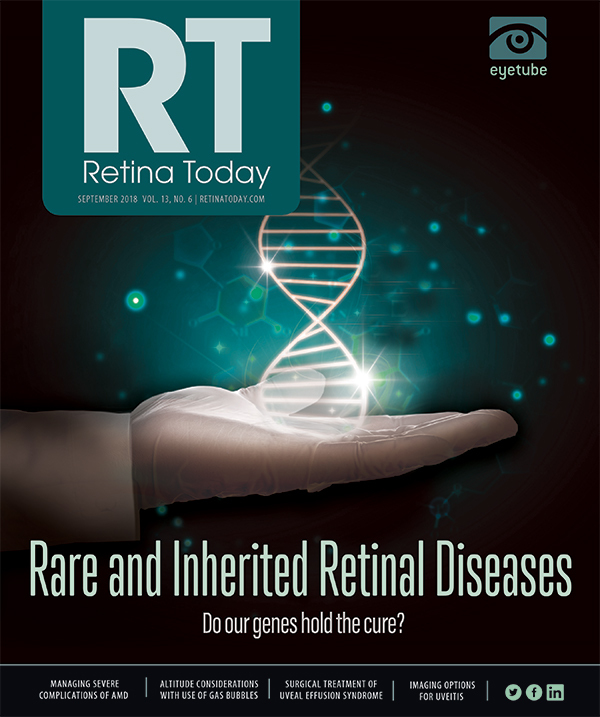 Rarely, if there is a highly bullous exudative retinal detachment, secondary drainage of the fluid can be added, but this is often not necessary. 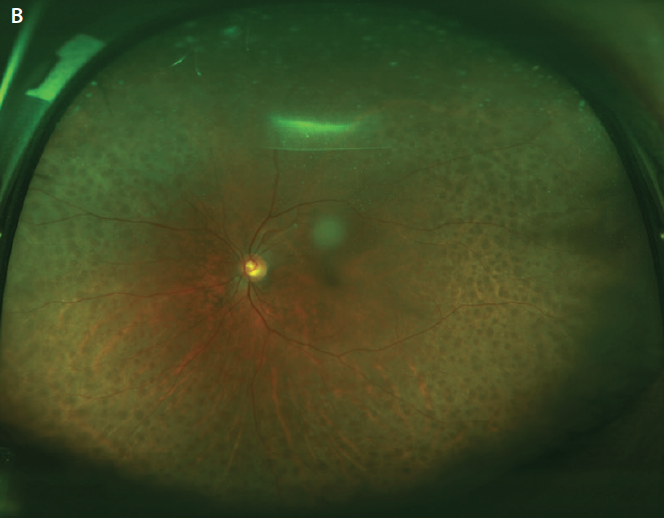 UES is a rare idiopathic cause of choroidal detachment that may be associated with nanophthalmos and increased scleral thickness. Concomitant chronic serous retinal detachment involving the macula can lead to permanent vision loss. Multimodal imaging can be helpful to confirm UES and differentiate it from other causes of choroidal effusion. Although some eyes with normal axial length and no scleral thickening may respond to treatment with oral, topical, or periocular corticosteroids, many will require surgical intervention to facilitate the flow of fluid from the choroid through the sclera. However, a delay in diagnosis of this condition prior to definitive surgery may result in chronic visual compromise. The review provided above may be helpful for clinicians who encounter patients with this rare but potentially serious condition. 1. Faulborn J, Kölli H. Sclerotomy in uveal effusion syndrome. Retina. 1999;19(6):504-507. 2. Gass JD, Jallow S. Idiopathic serous detachment of the choroid, ciliary body, and retina (uveal effusion syndrome). Ophthalmology. 1982;89(9):1018-1032. 3. Elagouz M, Stanescu-Segall D, Jackson TL. Uveal effusion syndrome. Surv Ophthalmol. 2010;55(2):134-145. 4. Johnson MW, Gass JD. Surgical management of the idiopathic uveal effusion syndrome. Ophthalmology. 1990;97(6):778-785. 5. Brockhurst RJ. Nanophthalmos with uveal effusion. A new clinical entity. Arch Ophthalmol. 1975;93(12):1989-1999. 6. Lam A, Sambursky RP, Maguire JI. Measurement of scleral thickness in uveal effusion syndrome. Am J Ophthalmol. 2005;140(2):329-331. 7. Trelstad RL, Silbermann NN, Brockhurst RJ. Nanophthalmic sclera. Ultrastructural, histochemical, and biochemical observations. Arch Ophthalmol. 1982;100(12):1935-1938. 8. Ward RC, Gragoudas ES, Pon DM, Albert DM. Abnormal scleral findings in uveal effusion syndrome. Am J Ophthalmol. 1988;106(2):139-146. 9. Yue BY, Duvall J, Goldberg MF, et al. Nanophthalmic sclera. Morphologic and tissue culture studies. Ophthalmology. 1986;93(4):534-541. 10. Gass JD. Uveal effusion syndrome: a new hypothesis concerning pathogenesis and technique of surgical treatment. 1983. Retina. 2003;23(6 Suppl):159-163. 11. Jackson TL, Hussain A, Salisbury J, et al. Transscleral albumin diffusion and suprachoroidal albumin concentration in uveal effusion syndrome. Retina. 2012;32(1):177-182. 12. Brockhurst RJ. Vortex vein decompression for nanophthalmic uveal effusion. Arch Ophthalmol. 1980;98(11):1987-190. 13. Uyama M, Takahashi K, Kozaki J, et al. Uveal effusion syndrome: clinical features, surgical treatment, histologic examination of the sclera, and pathophysiology. Ophthalmology. 2000;107(3):441-449. 14. Davies EW, Sanders MD, Harry J. Annular serous detachment of the choroid. Trans Ophthalmol Soc U K. 1973;93(0):145-159. 15. Ghazi NG, Richards CP, Abazari A. 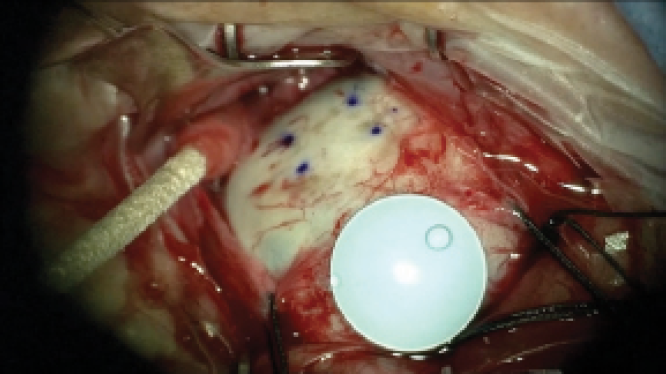 A modified ultrasound-guided surgical technique for the management of the uveal effusion syndrome in patients with normal axial length and scleral thickness. Retina. 2013;33(6):1211-1219. 16. Okuda T, Higashide T, Wakabayashi Y, et al. Fundus autofluorescence and spectral-domain optical coherence tomography findings of leopard spots in nanophthalmic uveal effusion syndrome. Graefes Arch Clin Exp Ophthalmol. 2010;248(8):1199-1202. 17. Harada T, Machida S, Fujiwara T, et al. 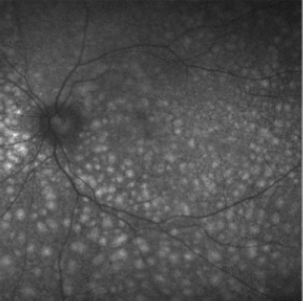 Choroidal findings in idiopathic uveal effusion syndrome. Clin Ophthalmol. 2011;5:1599-1601. 18. Kumar A, Kedar S, Singh RP. The indocyanine green findings in idiopathic uveal effusion syndrome. Indian J Ophthalmol. 2002;50(3):217-219. 19. Shields CL, Roelofs K, Di Nicola M, et al. Uveal effusion syndrome in 104 eyes: Response to corticosteroids - The 2017 Axel C. Hansen lecture. Indian J Ophthalmol. 2017;65(11):1093-1104. 20. Kerstetter JR, Brubaker RF, Wilson SE, Kullerstrand LJ. Prostaglandin F2 alpha-1-isopropylester lowers intraocular pressure without decreasing aqueous humor flow. Am J Ophthalmol. 1988;105(1):30-34. 21. Andrijević Derk B, Benčić G, Corluka V, et al. Medical therapy for uveal effusion syndrome. Eye (Lond). 2014;28(8):1028-1031. 22. Jackson TL, Hussain A, Morley AM, et al. Scleral hydraulic conductivity and macromolecular diffusion in patients with uveal effusion syndrome. Invest Ophthalmol Vis Sci. 2008;49(11):5033-5040. 23. Akduman L, Adelberg DA, Del Priore LV. Nanophthalmic uveal effusion managed with scleral windows and topical mitomycin-C. Ophthalmic Surg Lasers. 1997;28(4):325-327. 24. Suzuki Y, Nishina S, Azuma N. Scleral window surgery and topical mitomycin C for nanophthalmic uveal effusion complicated by renal failure: case report. Graefes Arch Clin Exp Ophthalmol. 2007;245(5):755-757. 25. Sabrosa NA, Smith HB, MacLaren RE. Scleral punch method with topical mitomycin C for safe revision of failed deep sclerectomy in nanophthalmic uveal effusion syndrome. Graefes Arch Clin Exp Ophthalmol. 2009;247(7):999-1001. 26. Yepez JB, Arevalo JF. Ex-Press shunt for choroidal fluid drainage in uveal effusion syndrome type 2: a potentially novel technique. JAMA Ophthalmol. 2015;133(4):470-471. 27. Schneiderman TE, Johnson MW. 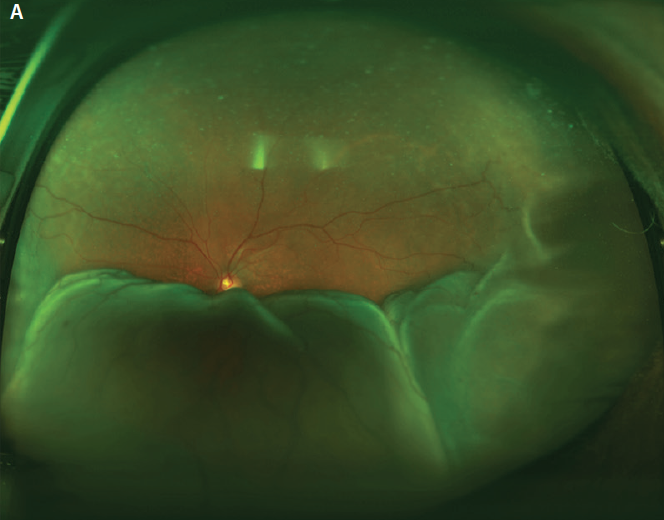 A new approach to the surgical management of idiopathic uveal effusion syndrome. Am J Ophthalmol. 1997;123(2):262-263. 28. Bausili MM, Raja H, Kotowski J, et al. 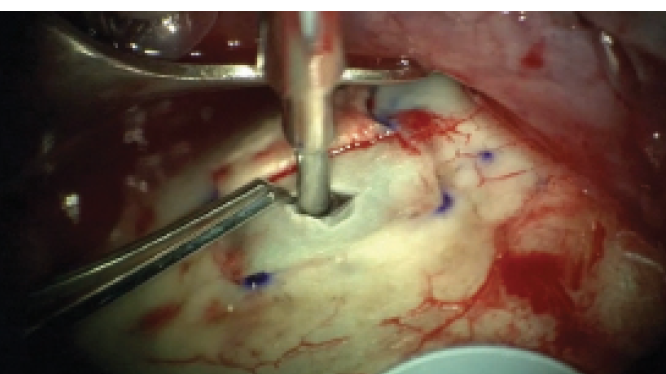 Use of fiberoptic-guided CO2 laser in the treatment of uveal effusion. Retin Cases Brief Rep. 2017;11(3):191-194. 29. Ozgonul C, Dedania VS, Cohen SR, Besirli CG. Scleral surgery for uveal effusion. Retina. 2017;37(10):1977-1983. 30. Matlach J, Nowak J, Göbel W. A novel technique for choroidal fluid drainage in uveal effusion syndrome. Ophthalmic Surg Lasers Imaging Retina. 2013;44(3):274-277.